I, Sir Rudiger, am here on the blog to let you know about a global team sport that you DON'T have to spend a lifetime training for. 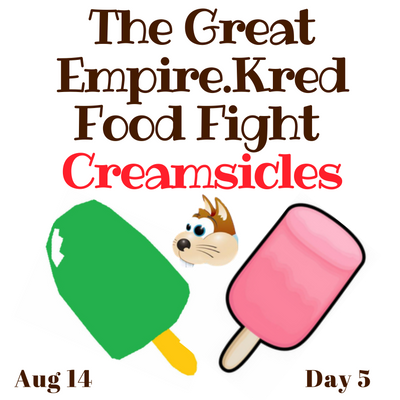 Presenting the Great Empire.Kred Food Fight! Check out the creamsicles we're throwing for National Filet Mignon Day. You can pick up a food pack so that you'll be automatically restocked every day. Or, use eaves or choose a smaller pack. Log in DAILY to see that day's food item and throw, throw, throw. Throwing any amount daily helps your team. Throwing EVERY DAY helps your team. Promote your team! Retweet or send your own. Throw as much as you can! We'll work to spread big buyers across the teams so everyone has a fair shot.